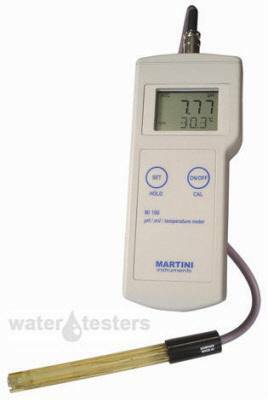 The Mi106 pH/ORP/Temperature Meter gives quick, accurate readings. Ideal for swimming pools and waste water treatment plants. Features Hold function to freeze readings for easy and accurate recording. Includes hard case, MA923D/1 pH/ORP/Temp Amplified Probe, starter calibration solution, and 9V battery. Combined smart lab grade portable meter pH/ORP/temp, range: -2.00 to 16 pH, -2000 TO + 2000 Mv, -5.0 TO 80.0 °C, resolution 0.01 pH / 1mV – 0.1 °C, accuracy (AT 25 °C) ± 0.02 pH / ±2 mV, temp ±0.5 °C to 60°C, ± 1°C above, typical EMC deviation ± 0.02 pH / ± 2 mV, Automatic Temperature Compensation, calibration: automatic in 1 or 2 points, supplied with MA923D/1 pH/ORP/temp amplified probe, a 9 V battery. The Mi106 has a stability indicator and hold feature that freezes the display for easy and accurate recording. The large display also has graphic symbols to guide you through all operations. When switched ON it performs a self-check and displays the percentage of the remaining battery level to assure proper working condition. Calibration is performed automatically at 1 or 2 points using standard or NIST buffers.